Imagine a future where we have survived a third world war. In the process, our country not only bears the scars of war, but our governing body is no longer the same. The government we knew built on the principles of freedom and individual rights has now been replaced with a single head of state and government rule that dictates what we are allowed to believe, what we can and cannot do, what we are allowed to read and learn. Churches have been destroyed and religions replaced by a secular government who now takes care of you. Any rebellion against this new ideology is squashed with re-training and indoctrination programs. All communication sources are governed by one source and we only receive the information our government wants us to have. 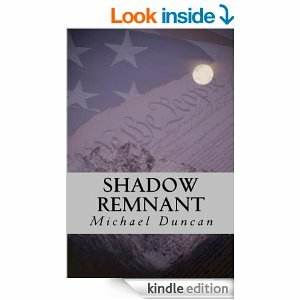 Shadow Remnant tells the tale of a boy who escaped from a re-training and indoctrination school, is hunted down by government police, shot and presumed dead. But a member of the Shadow Remnant, living in the wild rescues him and nurses him back to health. During those days he hears about God and love and grace for the first time. He hears accounts of what his country was like a hundred years before. When he goes back to retrieve a bible he had found while on the run, he is captured and sent to a prison island for insurgents who are forced to survive any way they can. It is here he meets his father who he thought was dead. His dad had at one time been a member of the new government. But when he found and read some of the old documents of our founding fathers, he no longer could live the lies now imposed by this new government rule. He became part of a shadow remnant of people. He was hunted down and condemned for life on this island. His wife was killed and his son sent to state schools. This is a fast paced book that holds your attention from beginning to end as we follow this young man, Peter, from capture to escape from the island to find other members of the shadow remnant. He makes it his mission to share with the rest of the nation what was lost – liberty and democracy and freedom. The story weaves through many perilous journeys. But God is with him and in spite of enormous dangers; he is able to find his way to other members who guide him on his mission. Scary? Preposterous? Perhaps. Yet many people have succumbed to the lure of giving up their responsibility by placing their freedom in the hands of someone else. When you read historical accounts of countries under dictatorship or socialistic rule, it is not only plausible but possible. Shadow Remnant gives us a glimpse of what it might be like when we no longer have the freedom to work hard and be in charge of our own lives and destiny.